• Cooking With Aromathera.. • Scenting the House • Practical applications a..
Aroma oils have such widespread applications along with the natural benefit of good fragrance that they can be incorporated in every sphere of our daily life. The therapeutic properties of essential oils can benefit all the family members at one go. One can create an ideal atmosphere at home by using aroma diffusers, Pot Pourris, sprays and vaporizers, and at the same time can clean the environment by using essential oils as disinfectant. Many oils act as insect repellent as well. The easy use of essential oils can be applied for cleansing and disinfecting the entire house. 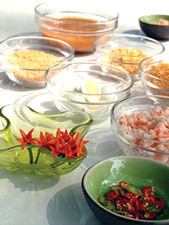 Another good news is that the therapeutic oils can be imbibed in cooking. Not to mention the added advantage of flavour enhancement. ·	Practical use of essential oils at home. ·	Scenting the entire house. ·	Cooking with Essential oils. The applications of aroma oils are so simple and effective that they may turn in pleasant addiction. By following Aromatherapy, one can lead a more enjoyable life in a well managed fragrant home.